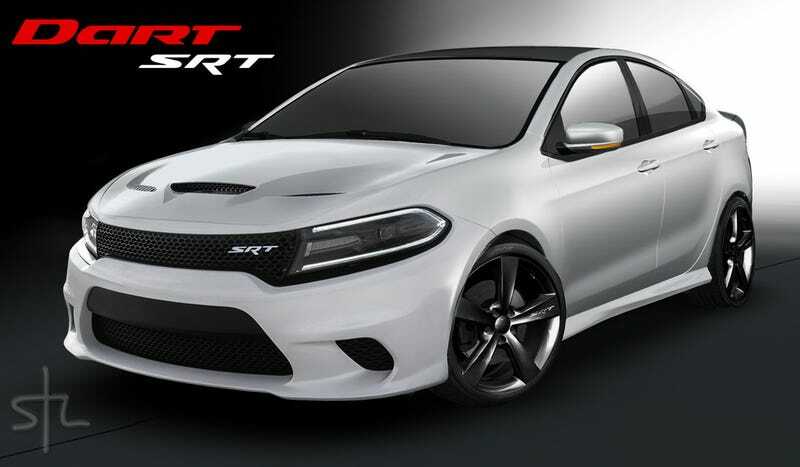 A Dodge Dart SRT is on its way, set to do battle with the Subaru WRX and the like with turbo power and all-wheel drive. But what will it look like? I'm really hoping it will turn out like this render from STL Media Design. It's a baby Hellcat! We haven't really heard much on the SRT Dart front in a while, not since the announcement was made at Fiat Chrysler's five-year plan presentation way back in May.Allpar thinks it could have 300 horsepower, which would be great, and make its debut at the end of 2016, which makes me sad because I want it sooner. At that point, you have to wonder if the current-generation Dart will be the one to get the SRT treatment, or if they'll save that for its replacement. Either way, I'm a fan of STL's design. It's nice and mean and incorporates a hood scoop for the turbo, so you know it means business. Now what should we call it? SRT4, or something meaner?